The Honourable Pablo Rodriguez, P.C., M.P. In 2017, Canada 150 celebrations gave rise to projects and activities all across the country. Over the course of that landmark year, the organizations in the Canadian Heritage portfolio—including the Canadian Radio-television and Telecommunications Commission (CRTC)—invited Canadians to learn more about their culture and heritage, to reflect on their future, and to journey down the path of reconciliation with First Nations, Inuit and Métis Peoples. In keeping with their own mandates, they also promoted Canadian creativity in a digital world, as well as the vitality of our official languages and Indigenous languages and cultures. As part of its project to celebrate Canada 150, the CRTC honoured 23 exceptional Canadians, for their contributions to our communications sector, including entrepreneurs, inventors, public figures and great communicators. At the Governor-in-Council’s request, the CRTC examined future distribution models for the creation, promotion and distribution of Canadian audiovisual programming. It invited comments, solicited the opinions of Canadians and commissioned evidence-based research to gain a better understanding of changing consumer behaviours and business models. The CRTC’s report will help the Government in its review of the Broadcasting and Telecommunications Acts. The CRTC also took steps to ensure that Canada’s broadcasting system responds to the needs of Indigenous communities in urban centres by granting licences for five new radio stations to serve these communities. As well, it reaffirmed its commitment to net neutrality by declaring that all Internet service providers must treat data traffic equally to ensure the free flow of ideas and information. As Minister of Canadian Heritage and Multiculturalism, I am pleased to present the 2017–18 Departmental Results Report for the Canadian Radio-television and Telecommunications Commission. This report offers an overview of what the CRTC has accomplished and demonstrates its ongoing efforts to build a society in which diversity is a strength and everyone is able to contribute in a respectful and inclusive atmosphere. I am pleased to present the CRTC’s 2017–18 Departmental Results Report. As we celebrated the CRTC’s 50th anniversary, we took the opportunity to reflect upon our past accomplishments and our focus on regulating in the public interest. The CRTC held a public consultation on how audio and video content will be accessed and distributed in the future to help prepare a report for the government. As part of this consultation, we invited Canadians to fill out a survey to gain insight in the choices they make when listening to music or watching video content. We also commissioned research to better understand the impact of audiences and revenues shifting from traditional to digital platforms on the creation of Canadian-made content. To improve public safety, the CRTC required that all telephone and mobile service providers update their networks in order to be ready to support next-generation 9-1-1 services by the end of December 2020. Next-generation 9-1-1 will provide Canadians with new and innovative emergency services and capabilities, such as the ability to stream video or send photos from an incident. Canadians also saw the end of locked mobile devices and unlocking fees thanks to changes made to the CRTC’s Wireless Code. Since December 1, 2017, Canadians can have their mobile devices unlocked free of charge by their provider, and all newly bought devices must be provided unlocked at no charge. In addition, the CRTC directed the large wireless service providers to come up with lower-cost data-only plans in an effort to promote affordability, innovation and choice for Canadians. In April 2017, we held a public consultation on the development of a broadband funding regime. Once established, a new fund will allocate $750 million over five years to build or upgrade fixed and mobile broadband Internet services in underserved areas across the country. This will support the CRTC’s target that Canadians have access to speeds of at least 50 megabits per second (Mbps) for downloads and 10 Mbps for uploads. To better protect Canadians from unwanted calls, the CRTC directed telecommunications services providers to develop technical solutions to block and trace illegitimate calls within their networks by March 2019. Furthermore, the CRTC took part in a global initiative to fight illegitimate online marketing activities and continued to work with its international partners to ensure commercial emails and text messages are compliant with Canada’s anti-spam legislation. As we look ahead to the next 50 years, the CRTC will continue to build on its reputation of being a world-class regulator. We look forward to hearing from Canadians as we work to maximize participation in our proceedings by using innovative digital tools and adopting best practices from other regulators. The CRTC’s total actual spending in 2017–18 was $63,604,746 and its total number of actual full-time equivalents was 449. For more information on the CRTC’s plans, priorities and results achieved, see the “Results: what we achieved” section of this report. The Canadian Radio-television and Telecommunications Commission (CRTC) is an administrative tribunal that regulates and supervises Canadian broadcasting and telecommunications in the public interest, as well as enhances the privacy and safety of Canadians. The CRTC undertakes its responsibilities with a focus on Canadians as citizens, creators and consumers. Canada’s communication system continues to evolve in a complex and dynamic manner, and is of growing importance in the lives of Canadians. Rapid technological innovation is continually changing the global communications landscape. These changes include Canadians’ increasing reliance on broadband, growing risks to cybersecurity, the rise of mass personalized media consumption and the displacement of advertisement revenues from traditional media to digital platforms. These trends have significant implications for the operating contexts of other government departments and agencies, but they have a direct impact on the CRTC’s core responsibility: regulating and supervising the Canadian communication system. In order for regulatory approaches to keep pace with current technological and social realities, the CRTC must assume that unforeseen change is now the norm and strive to be flexible and agile enough to continuously adapt to emerging realities. In 2017–18, the CRTC continued adapting to the transforming environment through policy innovation, knowledge partnerships and sustained dialogue with Canadians as citizens, consumers and creators. The CRTC must also be ready to respond to Government of Canada directives. In 2017, it received an Order in Council requesting that the Commission deliver a report, in 2018, on future audio-video programming distribution models. The Government of Canada also requested that the CRTC reconsider certain aspects of its 2017 decisions to renew the licences of Canada’s large television groups. To comply with these requests, and ensure that Canadians were consulted effectively, the CRTC reallocated resources from across the organization. The report on future audio-video programming distribution models was released in May 2018 and a decision on the licence conditions for large television groups is expected in 2018–19. the CRTC may not be able to anticipate and effectively respond to Canadians’ privacy, security and safety needs within the communication system. Throughout 2017–18, the CRTC took steps toward mitigating these risks, as described in the table below. The CRTC may not be able to ensure that a wealth of Canadian content is created and that Canadians have a choice of affordable quality communication services. The CRTC continued to monitor and strategically analyze market conditions and technological developments to advance regulatory policies. The CRTC engaged in continuous dialogue with Canadians, creators, and service providers to identify and analyze trends. The CRTC continued to collaborate with external parties on the promotion and discoverability of programming made by Canadians. The CRTC enhanced its collaborative efforts with key international and domestic organizations to strengthen its protection mechanisms. The CRTC focused its enforcement efforts using an intelligence-led approach and publicized high-impact cases to protect Canadians and promote compliance. The CRTC enhanced public awareness so that Canadians can protect themselves within the communication system. The CRTC proactively examined possible enhancements to 9-1-1 networks and evolved its regulations as a result. This program focuses on ensuring that a wealth of Canadian content is created and made available to all Canadians on a variety of platforms. Through its orders, decisions, licensing frameworks, and other regulatory activities, the Canadian Radio-television and Telecommunications Commission (CRTC) encourages the creation of diverse programming that reflects the attitudes, opinions, ideas, values, and artistic creativity of Canadians. By requiring the display of Canadian content in entertainment programming and the provision of information and analysis concerning Canada, the CRTC is enabling Canadians to better participate in their country’s democratic and cultural life. The CRTC measures the effectiveness of this Program by measuring the total spending on Canadian television production by independent production companies, private broadcasters, and public broadcasters, including CBC/Radio-Canada.Footnote 2 In 2016–17, the most recent year for which data is available, this spending was $2.99 billion. This is higher than industry spending for the prior year and exceeds the CRTC’s target of $2.6 billion. The CRTC also held a public consultation processEndnote ix to support the production of a report on future distribution models for Canadian programming and its continued creation, production and distribution. This report was requested by the Governor in Council in September 2017 and will serve to guide the Government of Canada’s review of the Broadcasting and Telecommunications Acts. The CRTC delivered the report, Harnessing Change: The Future of Programming Distribution in Canada,Endnote x in May 2018. It proposes new tools and regulatory approaches to support the production and promotion of audio and video content made by and for Canadians. The CRTC facilitates the orderly development of a communication system for all Canadians in order to strengthen the social and economic fabric of Canada and enhance the safety and interests of Canadians. This program focuses on ensuring that Canadians can connect to a choice of accessible, innovative, and quality communication services at affordable prices, and thereby have access to, amongst other things, compelling and creative Canadian programming. The CRTC measures the effectiveness of this Program by measuring the percentage of retail telecommunications service revenues from competitive markets (“competitive markets” are defined as areas where the CRTC has forborne from regulation, having found that a service is subject to sufficient competition to protect the interests of users, or where refraining from regulation is consistent with the Canadian telecommunications policy objectives.) In 2017–18, this measure was 97.3%, which exceeds the CRTC’s 94% target and demonstrates that most Canadians throughout the country have a meaningful choice of Telecommunication Service Providers (TSPs). Helped enable greater competition and choice in Canada’s broadband Internet services market. The CRTC directedEndnote xii facilities-based ISPs (large TSPs that own parts of Canada’s “backbone” Internet delivery infrastructure) to make their facilities, including fibre, available on a wholesale basis to Internet service resellers in Ontario and Quebec. The CRTC also concluded its public consultationsEndnote xiii on the development of its broadband funding regime and launched a public proceedingEndnote xiv to make lower-cost data-only wireless plans available to Canadians across the country, as part of its efforts to foster affordability, innovation and choice in the wireless market. Through this program, the CRTC promotes compliance with and enforcement of its various laws and regulations, including unsolicited communications. It helps to ensure that Canadians have access to emergency communication services such as 9-1-1 service and alerting systems. As a result, Canadians have increased protection and benefit from a more secure communication system. The CRTC assesses the effectiveness of this Program by measuring the percentage of Canadians who consider that the CRTC is taking measures to enhance their safety and protection in the communication system. In a 2017 survey by Environics Research, the result was 60%. This figure exceeds the target of 50%, but was less than the response of 66% in the 2015 survey. DirectingEndnote xvi all wireless service providers (WSPs) using LTE (long-term evolution) networks to join the National Public Alerting System. This system allows emergency management officials, such as fire marshals and police agencies, to warn Canadians on their mobile devices of dangers to life and property, such as by sending text-message alerts. WSPs were required to install a wireless public alerting system on their LTE networks by April 2018 so that alerts could be sent to mobile devices connected to LTE networks, which are available to over 97% of Canadians. The CRTC also tasked service providers to work with their federal, provincial and territorial counterparts to develop an awareness campaign and test schedule. The democratic process, by registering parties who used a calling service provider or sent “robocalls” during federal by-elections in British Columbia, Alberta, Saskatchewan, Ontario, Quebec, and Newfoundland and Labrador. Total spending pertains to expenditures incurred by the CRTC in relation to all funding authorities approved during the fiscal year. Funding authorities include all parliamentary appropriations and revenue sources: Main Estimates, Supplementary Estimates, and Treasury Board Vote transfers (including the operating budget carry-forward), as well as revenues from broadcasting licence fees (part I), telecommunications fees and unsolicited telecommunications fees. For fiscal years 2015–16 to 2017–18, actual spending represents the actual expenditures as reported in the Public Accounts of Canada. For the period from 2018–19 to 2019–20, the planned spending reflects approved funding by Treasury Board to support CRTC’s programs, with the exception of a salary adjustment of $54,663 approved above the Main Estimates levels. Note 1: Actual spending reflects gross expenditures, which include respendable revenues. For fiscal years 2015–­16 to 2017–18, actual spending represents the actual expenditures as reported in the Public Accounts of Canada. The increase in actual spending between 2016–17 and 2017–18 is due mainly to a) an increase in salary expenses resulting from the ratification of collective agreements, including retroactive payments dating back to 2014–15; and b) an increase in information technology investments (equipment and software). The projected spending for fiscal years 2018–19 and 2019–20 corresponds to the planned spending level approved in the Main Estimates. An incremental amount of $54,663 approved above the Main Estimates levels will be funded through Supplementary Estimates. Other items such as salary adjustments for new collective agreements and carry-forward adjustments are unknown at this time. Therefore, none of these adjustments is reflected. The planned level of spending for 2018–19 and 2019–20 is lower than 2017–18 because from now on, it includes salary increases only for the current fiscal year. In 2017–18, the CRTC used all of its vote-netted revenue authorities (respendable revenue). This could occur again in the coming fiscal years. The decrease in full-time equivalents between fiscal years 2016–17 and 2017–18 is attributable to the departure of a number of employees, which was partially offset by new hiring, bringing the number of full-time equivalents to the 2015–16 level. Note: These figures are net departmental revenues and do not include the revenues collected on behalf of the Government of Canada, which totalled $119.3 million for 2017–18. 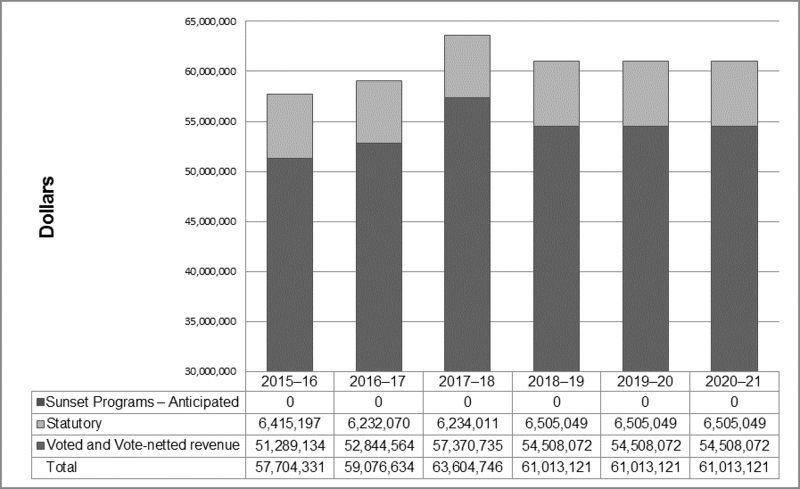 Revenues collected in 2017–18 totalled $170.9 million ($119.3 million plus $51.6 million), a net decrease of $0.7 million when compared to the total revenues collected in 2016-17. The decrease is attributable mainly to a decrease in miscellaneous revenues. Expenses in 2017–18 totalled $69.0 million, an increase of $4.2 million when compared to total expenses in 2016–17. The increase is attributable mainly to salary increases due to the ratification of collective agreements, including retroactive payments dating back to 2014–15. Assets in 2017–18 totalled $11.6 million, a net increase of $2.4 million when compared to total assets in 2016–17. The increase is attributable mainly to increases in the amount due from the Consolidated Revenue Fund and in tangible capital assets. Liabilities in 2017-18 totalled $11.1 million, a net increase of $1.3 million when compared to total liabilities in 2016–17. The increase is mainly attributable to increases in accounts payable and in accrued liabilities. Appropriate minister: The Honourable Pablo Rodriguez, Minister of Canadian Heritage and Multiculturalism, P.C., M.P. An Act to promote the efficiency and adaptability of the Canadian economy by regulating certain activities that discourage reliance on electronic means of carrying out commercial activities, and to amend the Canadian Radio-television and Telecommunications Commission Act, the Competition Act, the Personal Information Protection and Electronic Documents Act, and the Telecommunications Act,Endnote xxvi referred to as “Canada’s anti-spam legislation” or “CASL” in this document. The CRTC’s Strategic Outcome and Program Alignment Architecture of record for 2017–18 are shown below. The tax system can be used to achieve public policy objectives through the application of special measures such as low tax rates, exemptions, deductions, deferrals and credits. The Department of Finance Canada publishes cost estimates and projections for these measures each year in the Report on Federal Tax Expenditures.Endnote xxxi This report also provides detailed background information on tax expenditures, including descriptions, objectives, historical information and references to related federal spending programs. The tax measures presented in this report are the responsibility of the Minister of Finance. A report on the plans and expected performance of an appropriated department over a three‑year period. Departmental Plans are tabled in Parliament each spring. A long‑term and enduring benefit to Canadians that is linked to the organization’s mandate, vision and core functions. The CRTC is an administrative tribunal that operates at arm’s length from the Government of Canada; however, the CRTC reports to Parliament through the Minister of Canadian Heritage. The CRTC’s operations are subject to the Government of Canada’s policies and guidelines. The CRTC measures this performance indicator every two years. Environics conducted a public opinion poll for the CRTC in March 2017. Harris/Decima conducted a public opinion poll for the CRTC in March 2015, the results of which were used for 2014–15 and 2015–16.